The goal of this project is to build a small HF/VHF/UHF RF generator with correct and good performance for the lab. For a good stability, the clock reference come from a OCXO @10Mhz, particular attention will be carried on power supply, with the employ of low drop, low noise regulator. A useful “tracking” function is available, a small cheap little board with AD9833 will ensure a NBFM modulation from 1khz to 30khz. Due to high number of I/O needed, the MCU is based of Arduino MEGA. The output power will be controlled with a programmable PE4306 attenuator. Final filtered output signal will be measured with a ADL5513 log detector. 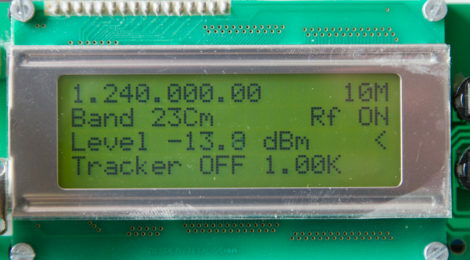 All of data are displayed on a 4×20 LCD. LF/HF output 1MHz to 35Mhz. HF/VHF/UHF 35Mhz to 2.5Ghz with harmonic filtering. RAW unfiltered 35Mhz-4.4Ghz output (with harmonics). Step size 10M/1M/100k/10k/6.25k and more. Tracking mode, internal modulator 1/30khz. Output level adjustable from -30dbm to +5dbm. (35 to 2.5Ghz). Internal 10mhz precision reference with OCXO. Harmonics rejection with 4 bands filtering switch. on va attendre le descriptif ..